We can't resist a fresh patch of pavement. It calls to us. 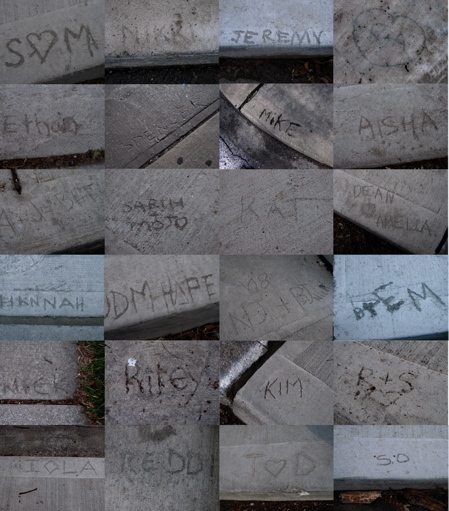 All over the city, beneath our feet, there are words written in the cement. People declaring their love, their friendship, or just writing their own name. These are little bits of history that show the world who passed by. "I was here," these words seem to say, "I mattered." Next time you are walking through your neighborhood, look down. You'll be surprised at what you see. And if you happen to stumble across a lovely soft patch of cement, go for it! What do you want people to know about you? Write it down this weekend, story makers. See you back here on Monday. Oh, and I hope you'll allow me a moment of shameless self-promotion by sharing the link to an "Image Interview" I did about a month ago. This is an amazing project, founded by the wonderful Joel Yum. Joel photographs creative folks doing what they do, and then publishes it on The Image Interview website. Check out mine! Loved the interview Britt, your place is a place where stories collect. And what a beauty you are.